Can you handle this? Cargo Pilot takes you through the life of a hard-pressed Cargo Pilot flying your way through a career starting at small desolate strips with single-engined aircraft and moving up to international operations with massive jets! 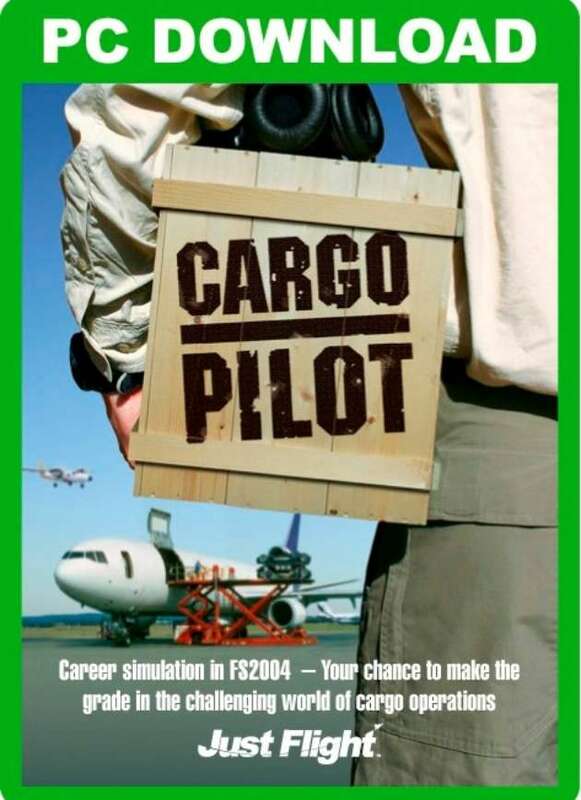 Cargo Pilot gives you a structured career in the world of Air Cargo, from flying chickens in and out of Jungle strips to moving racing cars around the World in the 747 Freighter... but, Big Brother is watching you! You will need to fly and operate in a safe and on-time fashion to ensure that you progress onwards and upwards - failure to do so and a life of being stuck in the jungle awaits you! Run your own air freight company. Open bases around the world to increase the range of your operations. Buy new, bigger aircraft to fly more cargo on longer routes. 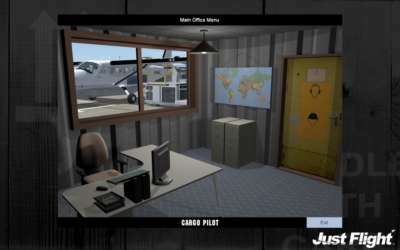 Beginning as a small start-up in a disused Cargo Container as office you can soon become an international player in the business - and even your office will improve during the course of the simulation. Use your own aircraft! 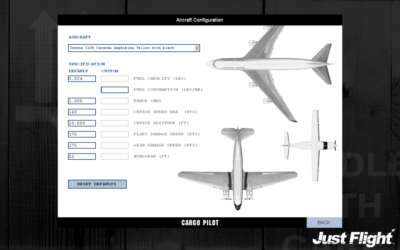 Fly any aircraft that you have installed in Flight Simulator - if you can afford them, that is! Note: Cargo Pilot requires the Microsoft .NET Framework 2.0. 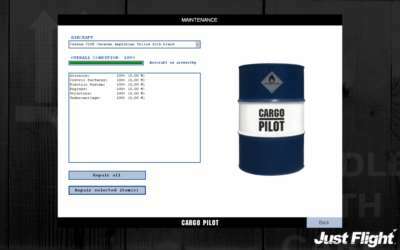 The 32-bit version is supplied with the Download version of Cargo Pilot. Users with a 64-bit operating system (XP64, Vista) should download the 64 bit version here. Captain Cargo! 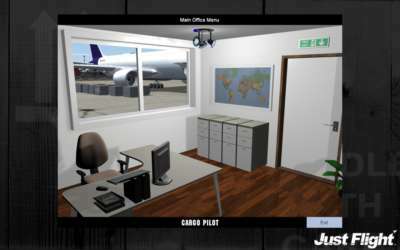 Fly your own aircraft and build your own cargo airline around the globe. 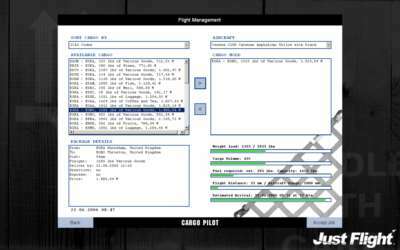 Cargo Pilot allows fictional airline names to be used in order to create an individual airline for each pilot. Start small - get BIG! Start with a single-engined prop aircraft flying from a small base in the middle of nowhere and progress up to massive multi-engine jet freighters at international airports. Earn £! The more cargo you fly safely and over longer distances, then the more money you will earn for you and your airline. Go LARGE! Once your airline has grown more financially secure then you will be able to expand to fly from larger bases and be able to purchase larger, more complex aircraft. Choose to fly your aircraft of choice. Fly the World! 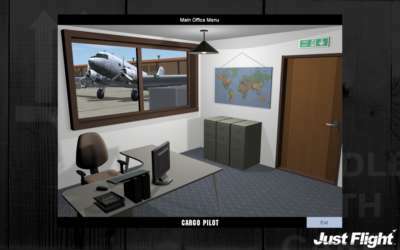 You can fly from any airport in the Flight Simulator world to any other airport. Routes can be preplanned. The 'Black box' - or as we call him, 'Bertie' - is watching you! A custom designed 'black box' sits in the back of your aircraft and tracks your flight from the moment you start your assignment to the bitter end. Bertie will evaluate and report back on your performance, monitoring amongst other parameters, engine start time, departure time, waypoint times, altitudes, landing time and even engine shutdown time. And don't forget to give the chickens and pigs a smooth flight, as any deviation from the acceptable flight envelope will be noted by Bertie and reported back to Operations. So fly the plane, do the route and do it do it according to the rule book and success is on the menu; but remember - as your experience grows, Bertie's expectations of your abilities grow as well. Can you fix it, mate? 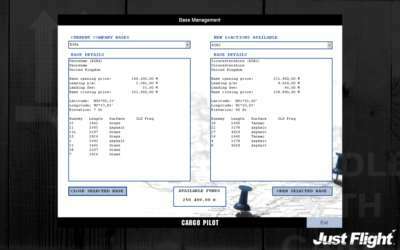 Maintenance module: Your aircraft need to be flown safely and some of your earnings need to be re-invested into regular planned maintenance. All your flights are monitored and aircraft stress and abuse is logged. If your aircraft is being overstressed, not maintained on time or maintenance funds are lacking, then inevitably some aircraft systems will fail and your safety record will get worse. Intelligent operations. Flights will be assigned by the OPS program according to the aircraft available and their range. Longer flights are pre-planed but shorter flights are direct routes and therefore have more freedom, being outside the pre-planned regime. A decent briefing! Briefings include the full route, fuel requirements and weather reports. The weather briefing includes all the necessary information required to successfully complete your flight. Briefings can be printed out. Look out! Look out! There's a storm about! Realistic weather settings from the custom-built weather generator reflect the selected difficulty level and your experience. These range from clear blue skies to dark deadly thunderstorms. ATC help - You can fly the routes under FS ATC guidance. Want a challenge? A set of difficulty levels are available to allow you to fly to your capabilities. Plan your flight! 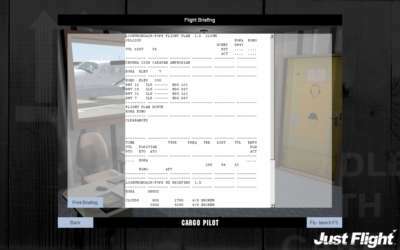 The Flight Operations program (Flight Ops) provides all the required pilot administration, career simulation and pre/post-flight simulations from generating the Flight assignments, flight plans, briefings, debriefings, evaluating the pilot's performance, income and maintenance calculation, aircraft purchases down to even rostering the aircraft for you to fly. Brilliant artwork! Custom splash screens and a fully graphical user interface will make you 'feel there'. Even your office interior will change the further you progress through the simulation. Full German manual available to download from the Support section. Note: Cargo Pilot requires the Microsoft .NET Framework 2.0. If you do not have the .NET Framework 2.0 on your system you will need to download it here. 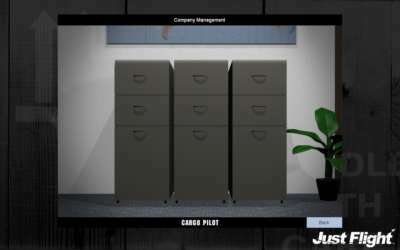 Cargo Pilot takes you through the life of a hard-pressed Cargo Pilot as you start small and then work your way up to international jet operations! 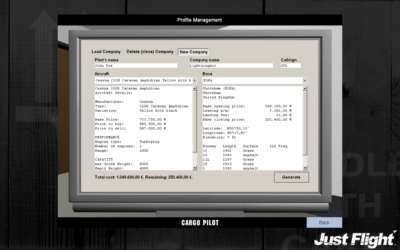 Cargo Pilot gives you a structured air cargo career, but you will need to fly safely and be on time to make progress. Open new bases, buy bigger aircraft and you'll soon end up an international player in the business!